Nova Scotia Musician Asif Illyas builds full size Boeing 737 cockpit in his home and launches new, internet music show. Musician Asif Illyas, former lead singer and guitarist of Canadian pop-group, MIR, has created a new, exciting show, with an aviator’s twist, that features collaborations and performances from noted Canadian artists. Borne out of a desire to create a new way to “tour” while taking care of his family; staying close by to be a caregiver to his Type 1 diabetic daughter, Asif thought of a concept based on recent hit shows like Seinfeld’s, “Comedians in Cars Getting Coffee” to be able to showcase the music he creates as well as highlighting the talented artists that he has worked with. “I was in my office with a flight simulation program on the computer after watching an episode of Seinfeld’s show the night before. I was tossing around the idea, with a friend, about recording a new solo album when the idea came to me to build a full size cockpit and take my musician colleagues on a flight over places they’d toured and play a song or two and learn about the details of their songwriting and their journeys.”, says Illyas. Illyas called his long-time, childhood friend, industrial designer Nicholas Imrie, and they designed a full scale Boeing 737-800 cockpit in a spare room in Illyas’ home in Halifax. 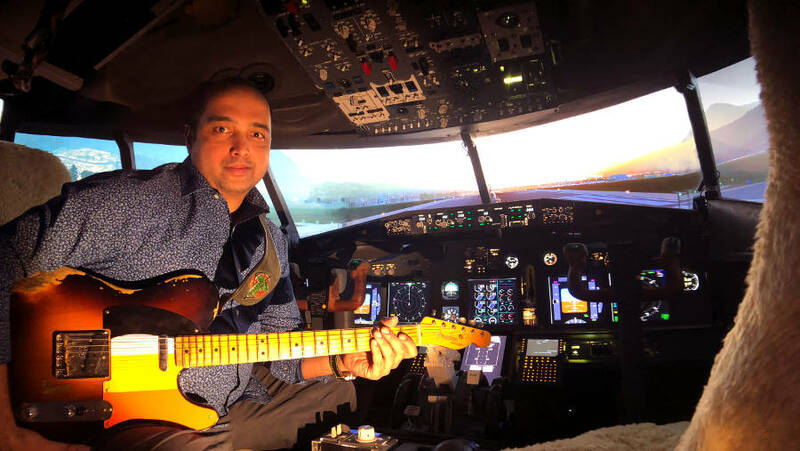 After countless hours of construction and dedication, Illyas had the vehicle to execute his dream of marrying his love of aviation with the world of music. Initial episodes include artists like Alan Doyle, Ria Mae, Joel Plaskett, David Myles and more; and even a real veteran Boeing 787 Airline captain, Dan Conlon who also plays guitar. Asif Illyas is an ECMA award-winning veteran of the Halifax music scene and currently spends most of his time creating music for film and television. He has written the scores for feature films such as “Weirdos”, “The Child Remains”, “Blackbird”, “The Chocolate Farmer” and hit-documentaries such as “Sickboy”, “Fanarchy”, “Bounty – Into The Hurricane”, “Forever Young” among many others. Illyas has also produced many recordings for local artists such as Ria Mae.